The late 19th century was the age of the art manifesto. At no time in history have the concepts and creation of art and design been so publicly scrutinized and debated by the artists themselves. This exhibition explores the design reform movement by combining the writings and designs of its leaders. Single objects are juxtaposed with carefully chosen quotations from that designer's writings. The pairings of words and objects sparks a connection - sometimes a strong correlation, sometimes disparity. The exhibition includes 12–15 pairings, drawing from the collections of the Milwaukee Art Museum, local institutions and private collections. The study begins with AW Pugin and William Morris and finishes with the work of Le Corbusier, de Stijl and the Bauhaus. Other designers featured may include Louis Sullivan, Christopher Dresser, Frank Lloyd Wright, Henry Van de Velde, Elbert Hubbard, Ralph Whitehead, Charles Rohlfs and Adolf Loos. The exhibition is organized by the Milwaukee Art Museum and curated by Nonie Gadsden, associate curator of decorative arts. 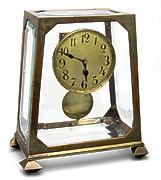 Adolf Loos, Mantelpiece Clock, 1897-1907. Brass and beveled glass panels. Lent by Daniel Morris and Denis Gallion.